University of Kansas students, faculty and staff offer thoughts on traits they'd like to see in KU's next chancellor Tuesday, Jan. 10, 2017, at the Kansas Union. David Dillon, chairman of the KU chancellor search committee, and Bill Funk, president of the search firm R. William Funk and Associates, led the open forum. University of Kansas students, faculty and staff opened up Tuesday about what they’d like to see in their next leader. A picture emerged of a person who is not afraid to tackle some of the university’s most unflattering problems head-on. 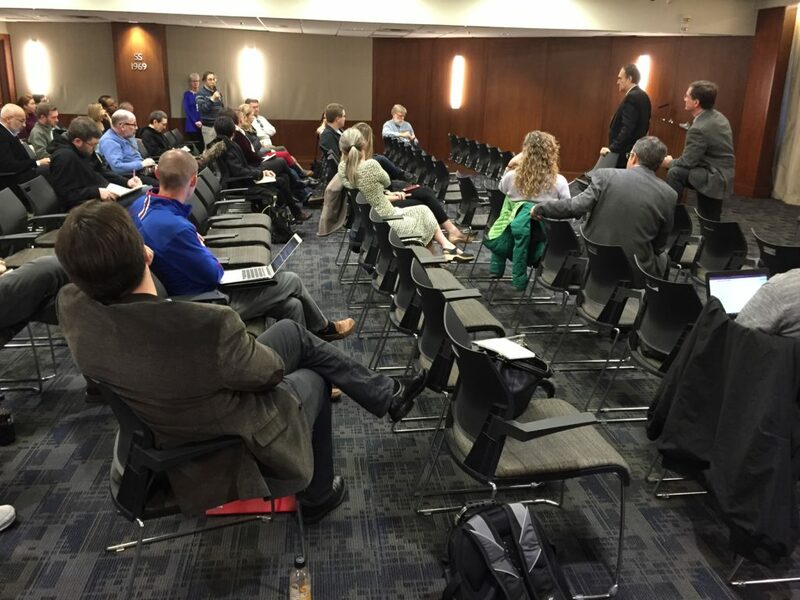 About 40 people attended an open forum at the Kansas Union to gather input for the KU chancellor search, hosted by David Dillon, chairman of the KU chancellor search committee, and Bill Funk, president of the search firm R. William Funk and Associates. While the search will be closed — meaning no candidates will be publicly disclosed except the person who is ultimately hired — Funk said the Kansas Board of Regents was “very emphatic” about search leaders meeting with constituency groups. He and Dillon said input would be used to help create a profile by which to vet candidates. The full 25-member chancellor search committee has its first meeting on Friday. KU’s current chancellor, Bernadette Gray-Little, has announced plans to step down at the end of this school year, and the Regents’ stated goal is to have a new chancellor hired and ready to start by July 1. Funk asked attendees what they saw as major challenges for the new chancellor, what kind of person they think would be best equipped to handle them, and what should be touted about KU to convince the best candidates to consider KU. Multiple speakers used the word “courageous” as a trait they’d like to see in their next chancellor, someone who is not afraid of thorny issues and would pursue what’s best for KU despite sometimes difficult political or social arenas. “KU is in a time of flux,” said senior Harrison Baker, citing the Student Senate’s funding of a multicultural student government and the chancellor’s later veto of it, as well as what he described as racist, transphobic and other hurtful incidents that caused some students to leave over the past year. “The new chancellor has the opportunity to face these challenges and make KU better for it by actively changing policies,” Baker said. Jen Brockman, director of KU’s recently created Sexual Assault Prevention and Education Center, said the new chancellor should demonstrate a commitment to combating sexual assault, whether the federal government continues to strongly police it or not. “KU has made dramatic steps over the last few years but still has far to go,” Brockman said. Speakers also addressed KU’s status with the Association of American Universities, calling it a weak member of the prestigious national group of leading research universities. A chancellor with a commitment to and understanding of research endeavors will be important, they said. Funding is and will continue to be another challenge, attendees said. The new chancellor must be able to “generate excitement” about higher education and research in order to secure funding, said Jill Hummels, communications manager for the provost’s office. Being politically savvy and being able to understand complex relationships within academia and between academia and the outside world will be important, attendees said. Baker said he and other students also would like to see a chancellor who is more social and visible to students and who has the skill of listening to students. “I have had many adults at this campus brush me aside because I am a student,” he said. He said KU’s active Student Senate and student body should be enticing for a new chancellor. The search firm and committee will recruit candidates and narrow the list in secret before forwarding finalists to the Board of Regents. However, Funk and Dillon encouraged attendees at Tuesday’s forum to spread the word that KU is in the market for a new chancellor and to send them names to consider.